Maybe you just inherited your grandma's china but your sister got the china cabinet. Or you found that perfect set of dishes in a vintage store that you don't need but will... Someday. Or perhaps you purchased a beautiful new dinner service but can't bear to part with the crockery your parents gave you when you got your first apartment. Whatever the reason, you decide to pack the extra dishes and store them. Storage units are a great place to keep fragile items that you don't want left where young children might find them and use them for play time or that need to be kept away from that brother that firmly holds to the motto 'mi casa es su casa' and might just decide to take a look-see at what you have in your closet and carelessly rummage through your breakables. Your dishes will need some padding to prevent breakage. To save money you can use crumpled or folded newspaper, or you can buy white packing paper to keep things a little cleaner. You can also buy bubble wrap or some sort of polystyrene material liking packing peanuts. A couple of other low budget options that might come in handy are plastic grocery bags, old nylons, towels or soft cloths from the rag bag. Preferably, dishes should be packed in something stronger and more resistant to pressure than a standard box. If you have nothing else, use extra padding. Dish barrels are designed for dishes. The modern version is generally made out of a double layer of cardboard, so are heavy-duty boxes, which are also a good option. For a little extra money, you can buy wooden packing crates. A great option for glasses, stemware and similar items are cell kits, boxes made with individual cells and layers. You can create your own layers in larger boxes by cutting a piece of cardboard and placing it between rows of dishes. Don't forget strong packing tape, markers and, if you like, box labels. Storage companies often sell packing supplies. In fact, you can refine your search on StorageFront to find a self storage facility near you that sells supplies on-site. Check to see if they have any boxes specially made for storing dishes. Once you have your supplies, organize your dishes and group items by size and weight. As you go through your dishes, evaluate what you really want to store and what can be given or thrown away. Saving space can allow you to rent a less expensive storage unit or give you room to tuck away some of the other items that need to be moved out of the house. If your boxes need to be set up, be sure to do so properly. Tape corners and edges with reinforced packing tape for added strength. Check with the storage specialist where you buy your tape to make sure you have the best kind for your purposes. Despite popular belief, duct tape is not for everything. Before placing dishes in a box, add a few inches of padding to the bottom. Crumple newspaper or packing paper to absorb impact or use bubble wrap or soft cloths. Pad the sides of the box, also. A few layers of paper can absorb some of those bumps that are bound to happen when you move the box into storage. Buy plenty of boxes. You don't want to pack too many items in a box. Allow room for padding. Evaluate for yourself how much you want to place in one box. Don't overfill them or make them too heavy. These are the boxes you least want dropped. Each dish should be wrapped individually. Place the item on the corner of a two- to three-layered square of paper and fold it around the dish. Tape the paper to keep the dish securely wrapped. 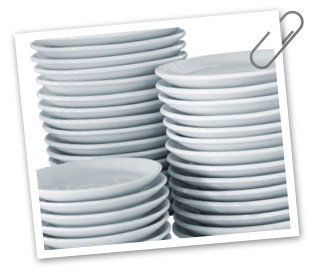 Place plates on their sides and nest like-sized pieces together to reduce impact when moving. Place glasses and cups rim down. Line the interior of cups and glasses with padding. Small items can be nested inside larger, sturdier pieces, but both pieces must be individually wrapped for protection. Provide padding between oddly shaped pieces like stemware to prevent pieces from moving or slipping and, of course, breaking. Place larger, heavier items in the bottom of the box. A piece of cardboard can create a clear divide between layers. Fill empty spaces with crumpled paper, bubble wrap, plastic bags or soft cloths. Be careful not to use cloths that could tangle in the dishes when you are trying to remove the cloth. Leave extra space in the top of the box, and add a few inches of extra padding. Make sure the box is packed evenly and padded thoroughly to prevent bulges or weak spots. Securely tape the boxes. Reinforce edges and corners. Clearly mark your boxes. If you can find different colored boxes or labels, you may want to color code your stored items. A bright red marker clearly stating the contents are "fragile" will also do the trick and should be used as a backup, anyway. Also, clearly mark what the boxes contain like "grandma's china" and provide enough detail to recognize the contents in the future. When placing items in a storage unit, put boxes of items further back in the unit that are less likely to be needed. Place fragile items on top of other items that you don't expect to open often. Although it's tempting to pack dishes quickly, a little planning and care can go a long way toward keeping your family treasures safe.